What I love most about travelling is coming across something that is totally unexpected, totally overwhelming and totally unforgettable. It can be the Rheinfalls in Germany, the Sagrada Familia in Barcelona, Tasman’s Arch in Tasmania, the Cathedral in Reims, Plitvice lakes or the S-bend in Austria. 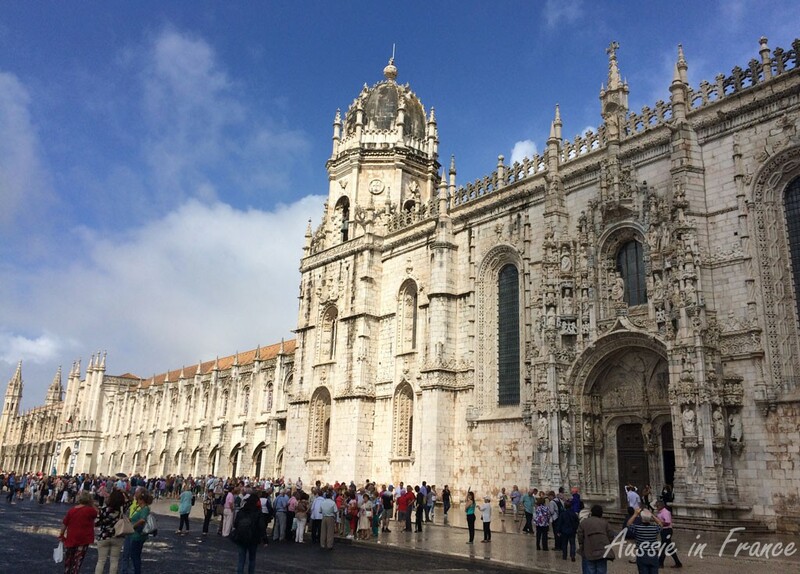 Today, it happened in Lisbon with the Jerónimos Monastery. After a good night’s sleep, we leave the apartment around 10 am, take the 758 bus to its terminus then the 714 to Belem. When we get out the bus at 11.30 am, it is pouring with rain. 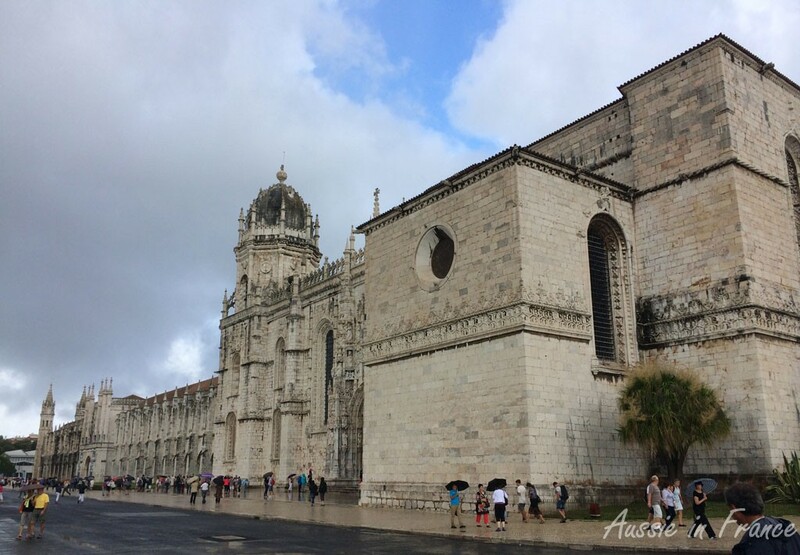 We put our rain jackets on, open our umbrellas and walk towards the Monastery. 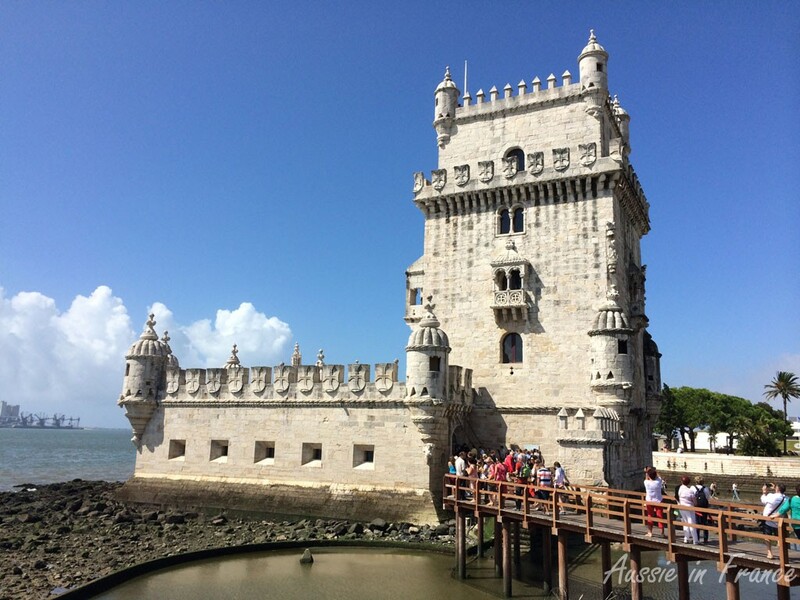 There are so many tour groups and individual tourists under the porch leading to the church that we abandon ship and decide to go and see Belem Tower first. Maybe at 12.30 pm, all the tour groups will be gone. 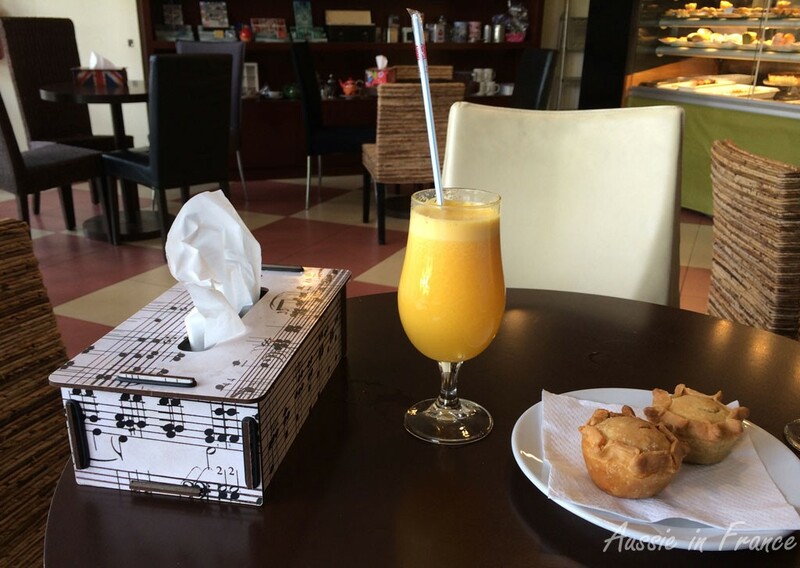 On the way, we stop off at Casa da Cha de Belem and have two empadas, one with spinach and fresh cheese and the other with cod, washed down with freshly squeezed orange juice to keep us going until a late lunch. As Belem Tower comes into sight in the distance, we cross a footbridge over the tram lines and walk down to the Tagus and the Tower, one of Portugal’s greatest icons. 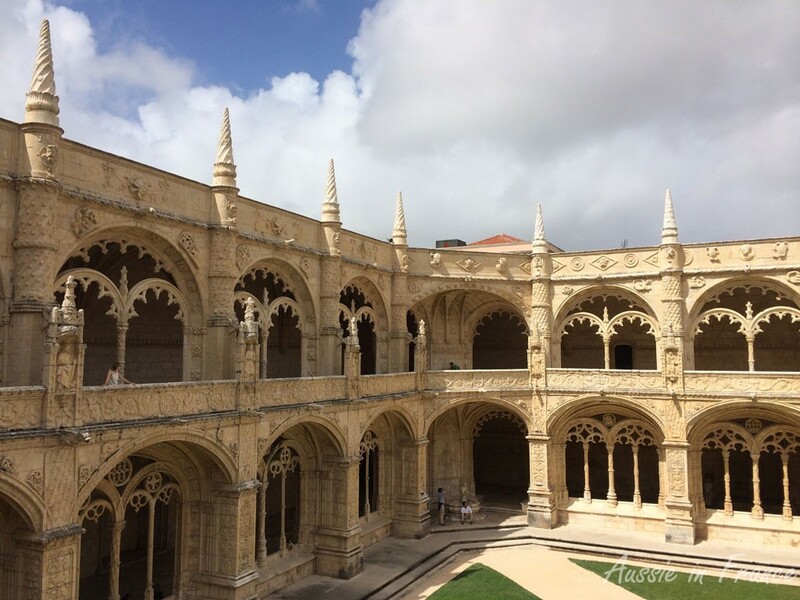 Built in the early 16th century, it is an excellent example of the Portuguese Manueline style, which is sumptuous late Gothic incorporating maritime elements and representations of the discoveries brought back by Vasco da Gama and Pedro Alvares Cabral, mainly financed by the proceeds of the lucrative spice trade with Africa and India. 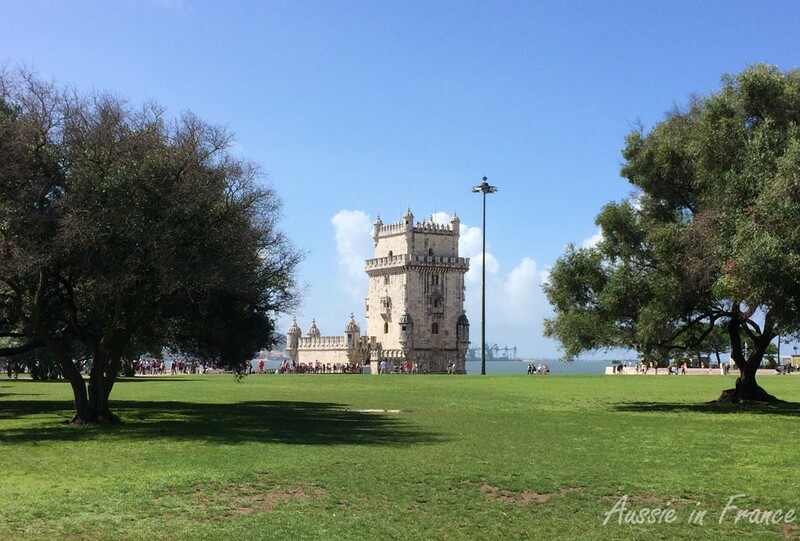 Surprisingly, the tower, built on a small island in the Tagus, was not destroyed by the famous earthquake of 1755. 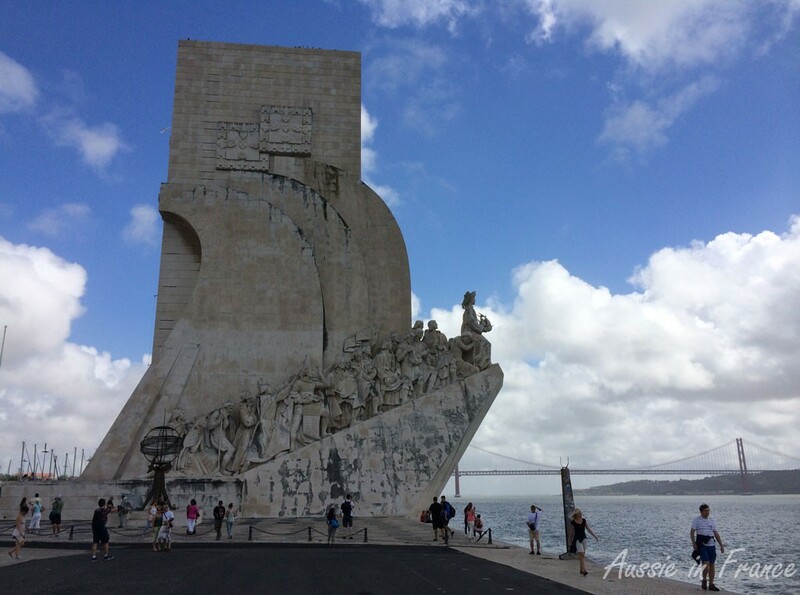 We walk back along the shore towards another, much later construction, called the Monument of Discoveries (Padrão dos Descobrimentos) built in 1960 for the 500th anniversary of the death of Henry the Navigator. 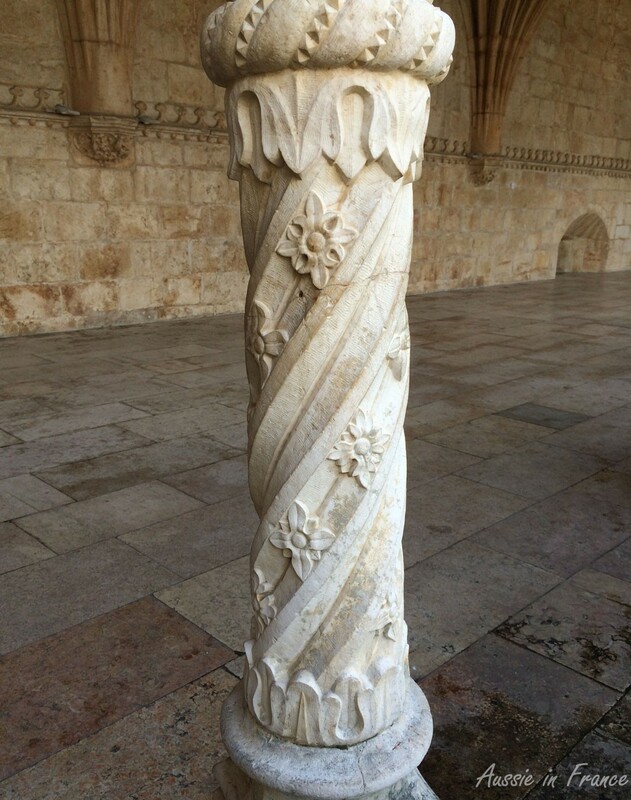 In front is a giant marble wind rose. A world map in the centre charts Portuguese explorations showing the most important dates in the Portuguese maritime history with ships marking the locations where Portuguese explorers first set foot on land. By now it’s nearly 1 pm so we’re hoping all the groups have hopped back on their buses. 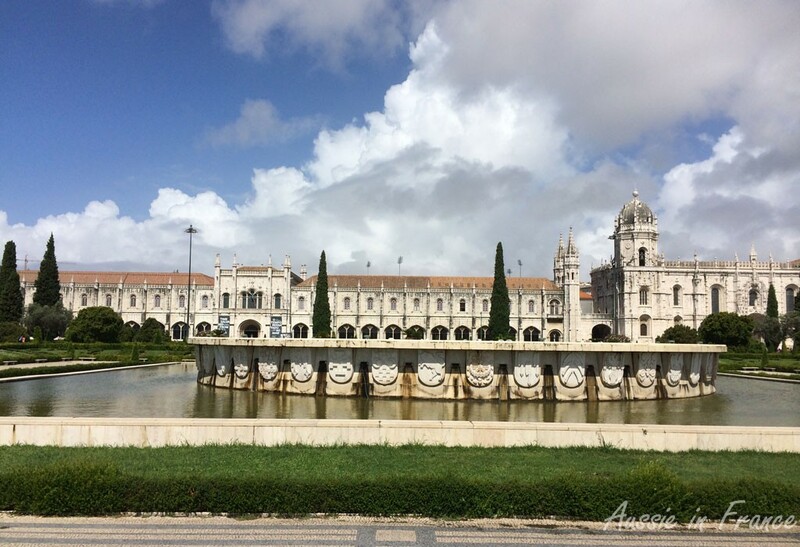 I take a photo of the monastery from the Praça do Imperio gardens. Just as we leave, Jean Michel looks back and says, “It’s a pity you missed the fountain.” So I go back and take a second photo. We arrive back at the entrance to the monastery and there is not even a queue! We think that due to the heavy rain this morning, the groups probably rescheduled their visits with everyone arriving at once. 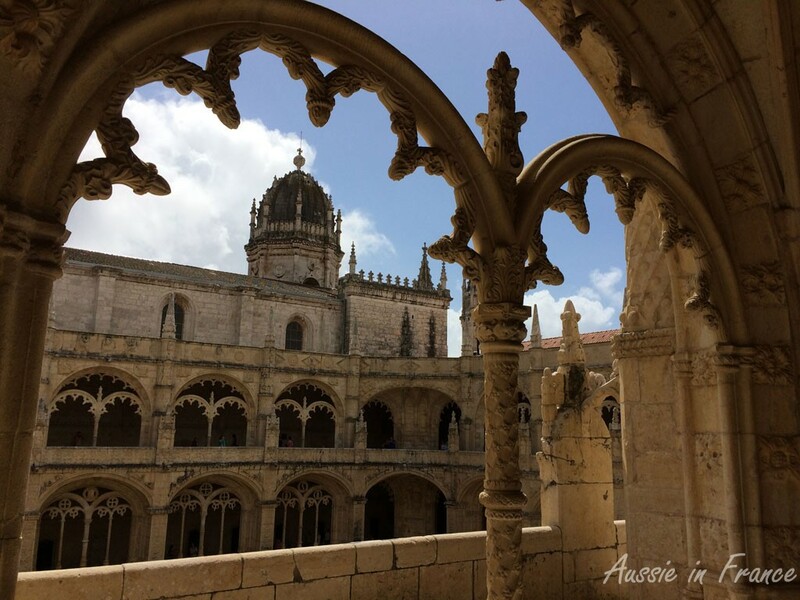 The monastery was built by King Manuel I at the beginning of the 1500s on the site of a hermitage founded by Prince Henry the Navigator, where Vasco da Gama and his crew spent their last night in Portugal in prayer before leaving for India. When we step in side, I am immediately reminded of the soaring columns of Gaudi’s Sagrada Familia. 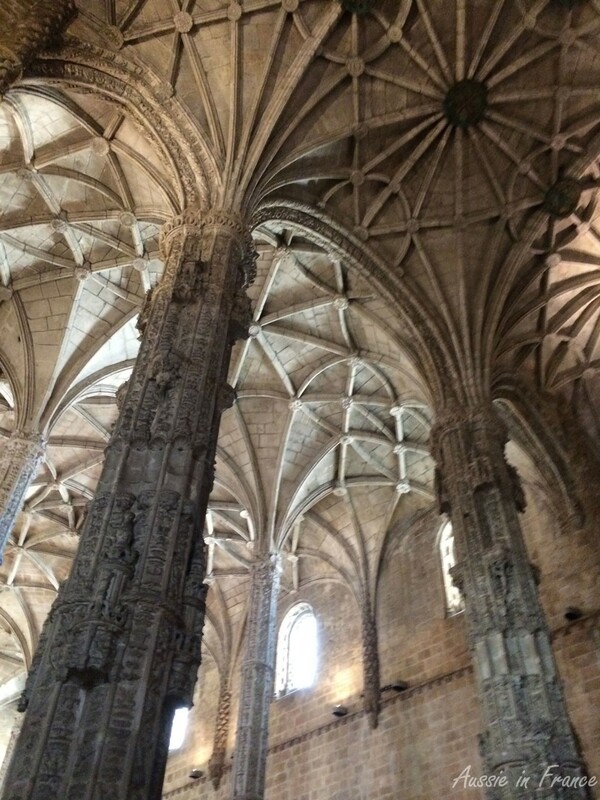 The vaulting is quite extraordinary and the octagonal pillars are covered with intricate sculptures. 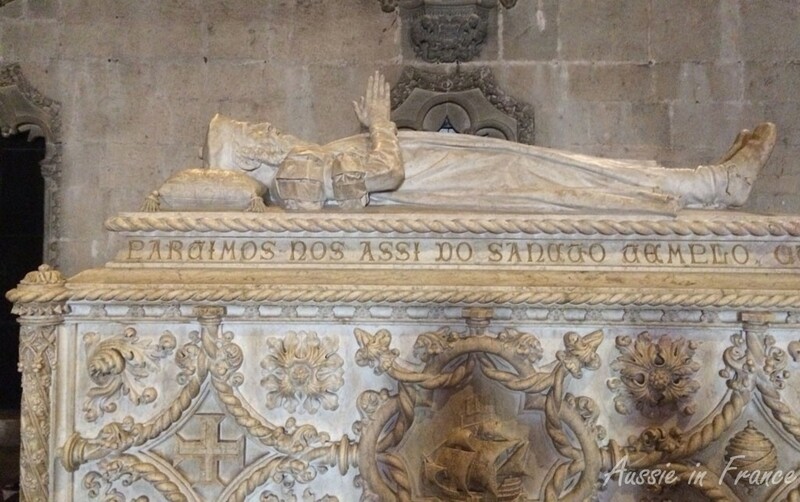 Vasco da Gama’s tomb is just inside the entrance, opposite that of the poet Luis de Camões, author of the epic The Lusiads recounting the exploits of Da Gama and his compatriots. As we leave the church, Jean Michel says that his guide book says the cloisters of the monastery are worth visiting. We pay our 10 euros each, walk up a flight of stairs and turn to the right. And there it is! 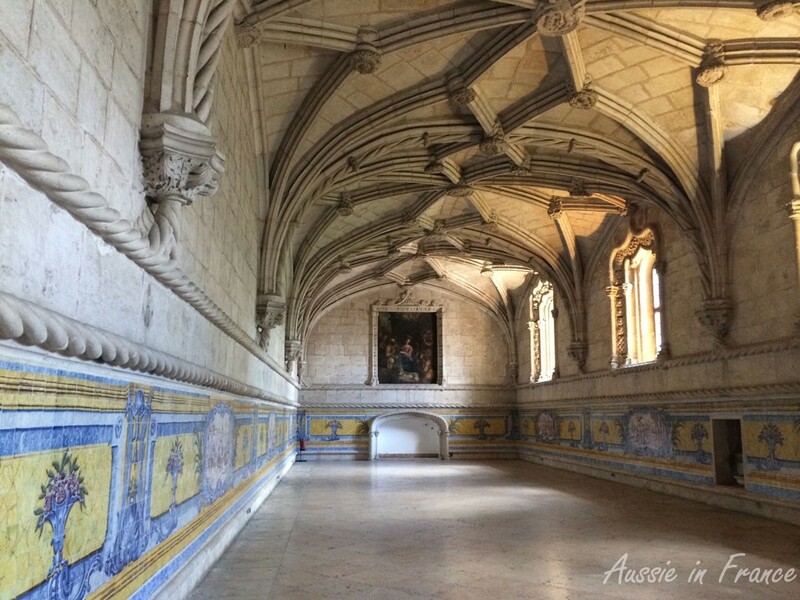 The most magnificent cloisters I have ever seen. First, they are two storied, which is most unusual. Second, the columns intricately sculpted, each with a different motif – coils of rope, sea monsters, coral and other birds and beasts all evocative of the great Portuguese sea discoveries. 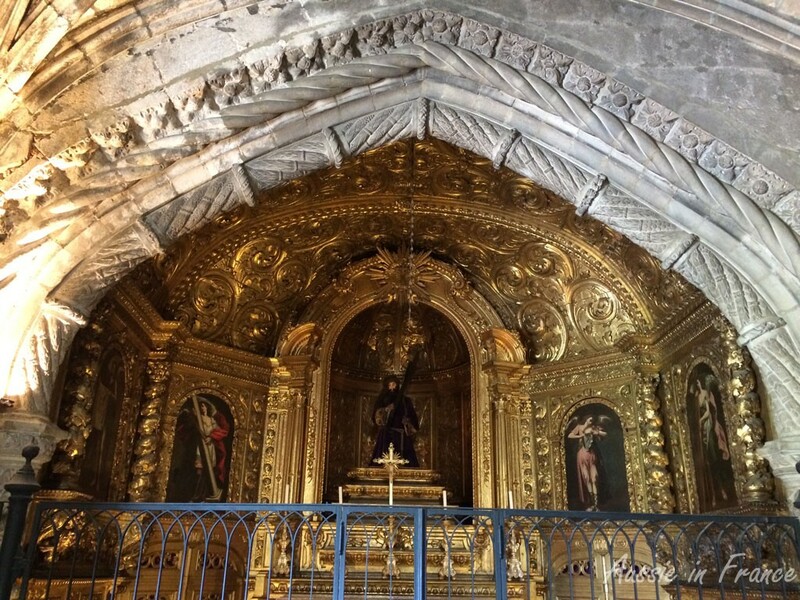 The monastery was founded by the Order of Saint Jerome (Hieronymites) whose spiritual job was to give guidance to sailors and pray for the king’s soul. We see a door on the right and walk in. It looks like a smaller church, with more vaulting and a gallery at one end. On the opposite end, I come to the refectory. These monks did not dine on bread and olives, I’m sure. 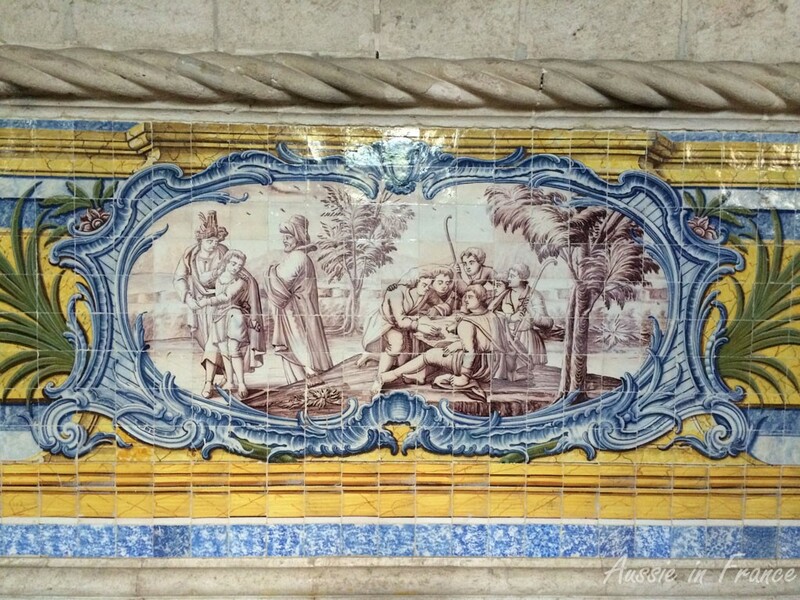 Around the walls are magnificent azulejos scenes. Jean Michel remarks that the fireplace at one end would not have heated the room very much in winter! I imagine the monks with their own private braseros. We follow a staircase up the gallery. 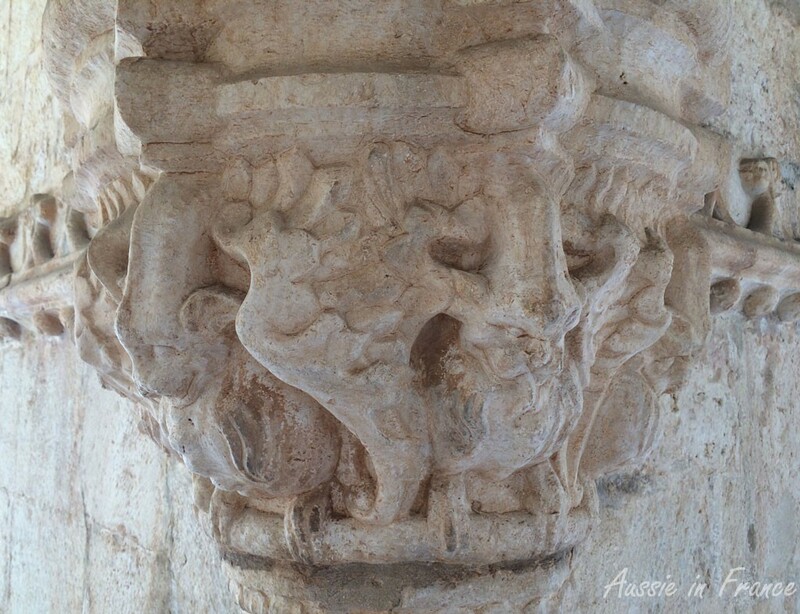 It resembles the one we saw at Fontevraud l’Abbaye but what we find when we come out is certainly very different! We wander around in amazement, looking at every arch and every pillar. The details are amazing. I can’t take enough photos but none of them do justice to the splendour before our eyes and I only have my iPhone with me. We stupidly forgot our Lumix in Blois! I’m not surprised to learn that it is a World Heritage Sight. 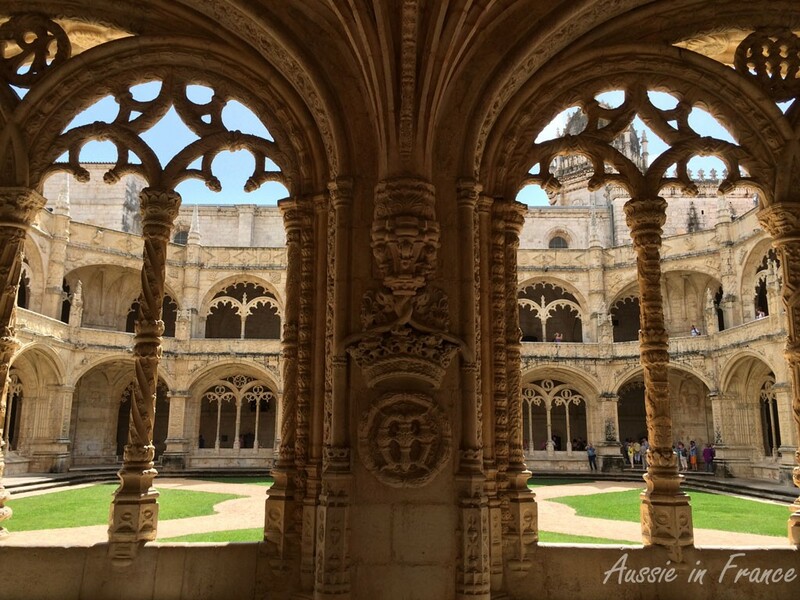 The magic of Jeronimos Monastery will remain with me forever. 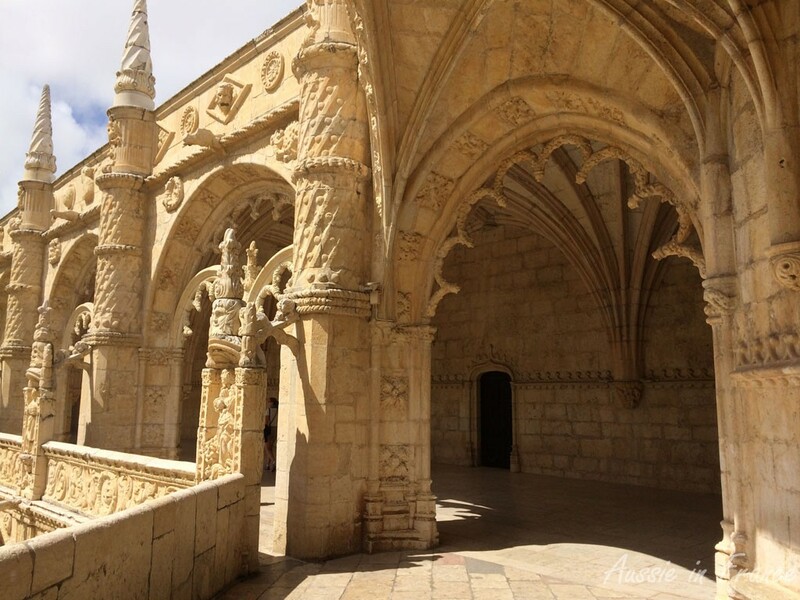 This entry was posted in Architecture, Portugal and tagged belem, belem tower, Casa da Cha de Belem, jeronimos monastery in Lisbon. Bookmark the permalink. What a special day Rosemary,I am happy for you! You look great,smiling in the sun! Thank you,you remind me of this absolutely Magnificent Monastery and I’l check my photos of details. Hello Anna! We often thought of Sofia when we were in Lisbon because it grows on you as you get to know it better. I’m so pleased that Plovdiv was selected European Capital of Culture for 2019. It is such a beautiful place. 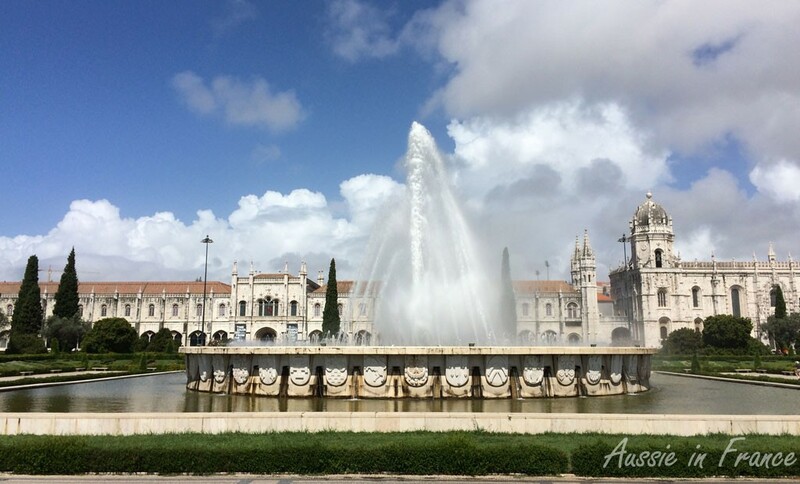 You’re making me want to pay a visit to Lisbon! I have found your blog through http://frugalfirstclasstravel.com/ and can’t wait to start reading … I’m planning a trip to France in 2015…so always love tips and recommendations. Hello Catherine, what a wonderful trip to look forward to! Have you been to France before? 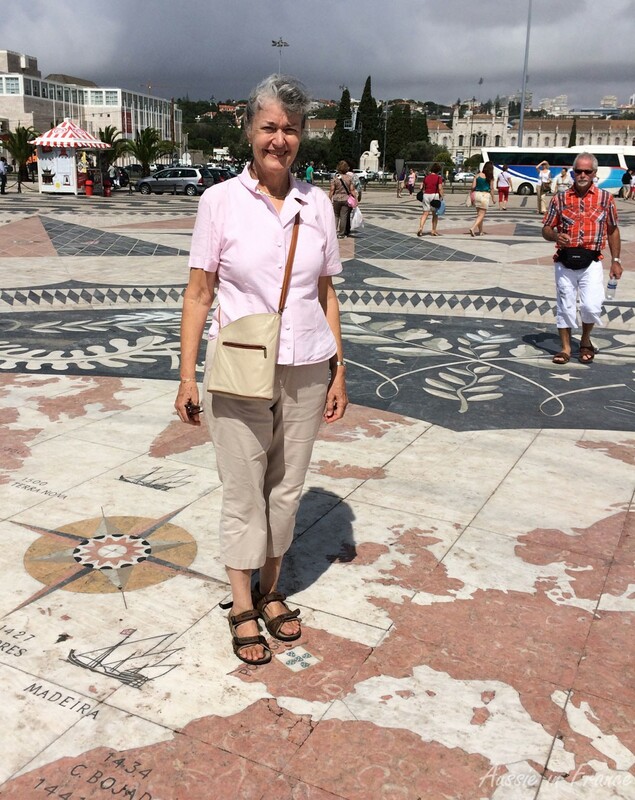 When we visited the Monument of Discoveries a few years ago someone in our tour group noticed there was just one woman depicted among all those men. I said it took all those men to equal one woman! That is the perfect reply!